Known for his work in the Latin music field, Michael Spiro is an internationally recognized percussionist, educator and recording artist. “Grupo Ilu-Aña”. His performing and recording credits cover an array of internationally known artists: from such pop artists as David Byrne, Carlos Santana and Charlie Watts, to Latin music icons Eddie Palmieri, Israel Lopez (Cachao) and Richard Egues, to such jazz luminaries as Ella Fitzgerald, Bobby Hutcherson and McCoy Tyner. He has an extensive film score resume, and wrote several arrangements for the Tony award winning Broadway show BLAST! In 2011 Michael was appointed Associate Professor of Percussion at Indiana University, where he has developed the curriculum for Latin music and culture in both the percussion and jazz departments. He has written, performed and produced several critically acclaimed instructional books and DVDs on percussion, and nine years ago launched two ground-breaking educational websites which offer complete instruction on Cuban and Brazilian percussion over the internet: congamasterclass.com and sambamasterclass.com. Michael continues to be in demand as a guest artist at universities worldwide, and is a frequent presenter at national and statewide conventions of the Percussive Arts Society. Michael remains an extremely active recording artist—in 2017 his CD “Canto America” (produced with his long time working partner Wayne Wallace) received widespread international acclaim and was nominated for a 2017 Grammy in the Latin Jazz category. His most recent project “BAKINI en el nuevo mundo” (produced with Joe Galvin) has an official release date of September 21st, 2017, and is further testimony to the depth and complexity of Michael’s recording and artistic skills. As a performer, he co-leads one of the only remaining charanga groups in the United States, “Orquesta La Moderna Tradición”, and also is the co-director (along with the great Santana percussionist Karl Perazzo) of an “all star” conjunto in the San Francisco Bay Area—“Conjunto Karabali”. Finally, he holds the conga drum chair in the internationally acclaimed (and 2011, 2014, and 2015 Grammy nominated) “Wayne Wallace Latin Jazz Quintet”, which continues to record and perform throughout the United States. José Luis Gomez was born and raised in Sancti Spiritus, Cuba, a town rich in music and folklore. From an early age, he was drawn to the music he heard in his environment: Trova Spirituana, Rumba Tonada, rumba, comparsas and coros y claves. As a youth he participated in the Comparsas Pueblo Nuevo and joined other folkloric groups. While studying sports in Havana he was exposed to different aspects of Afro-Cuban culture and as a young man became interested in and even applied to join the Abakua society. In the late 70s he spent two years in Africa, working as a basketball coach. Upon returning to Cuba, he moved to Havana, where he regularly attended street rumbas; specifically “El Sábado de la Rumba” held by the Conjunto Folklorico Nacional de Cuba every Saturday in their rehearsal space. There he was exposed to different Afro-Cuban expressions and his love for this genre grew. Upon moving to the Bay Area in 1982, he immediately joined Rumbafroson, a folkloric group directed by Judith Justiz. This led to connections and friendships with Bay Area musicians like Michael Spiro, John Santos, Fito Reinoso, Jesus Diaz and others. Later in the 80s he joined the Coro Folklorico Kindembo, directed by John Santos. With them, he shared the stage with well known musicians like Orestes Vilato, Francisco Aguabella, Israel Lopez Cachao, Armando Peraza, Chocolate Armenteros and others. Mora (Pancho Quinto), Jesus Alfonso (of Munequitos de Matanzas), and Giovanni Hidalgo as well as dancers Ana Perez and Juan de Dios Ramos Morejon. With the latter he shared the stage on numerous occasions and performed with his group, Raices Profundas. José Luis has been a vocalist with Fito Reinoso y su Ritmo y Armonia since 1996, and has been a vocalist on five of their recordings. He has also recorded with Omar Sosa, Bellita and Pancho Quinto. With John Santos and the Coro Folklorico Kindembo he has recorded on numerous occasions and has been nominated and been among the five finalists for the Grammys twice, once for the Latin and once for the general Grammys. 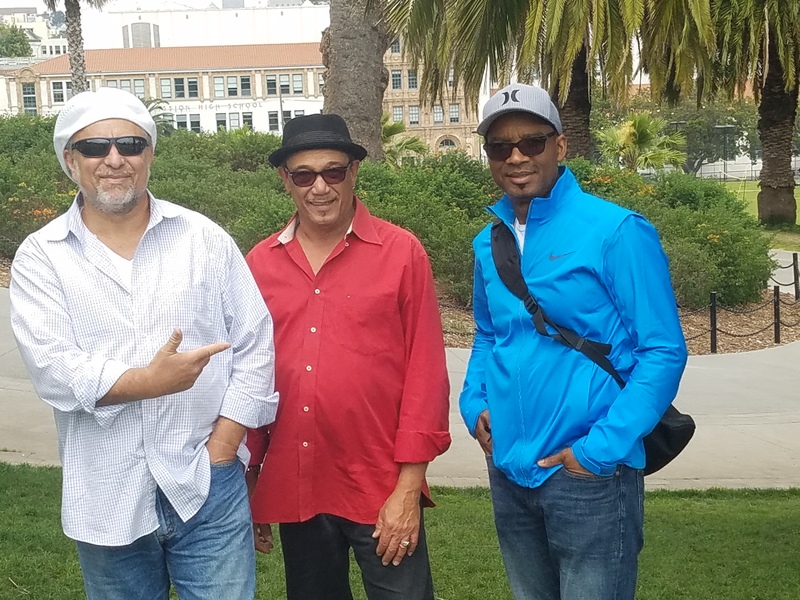 For 35 years in the Bay Area, José Luis Gomez has been an active musician and a dedicated promoter of Afro-Cuban music and dance. “Rumba is like el ajiaco, like Cuban gumbo: a blending of rhythms, songs, and dances that delights the heart and takes away your pain." Rumba can be played anywhere—at the kitchen table, on some buckets in the patio, on a desktop—whenever and wherever rumberos decide to start playing clave and want to sing about what’s going on their lives. That’s the way it’s long been in Cuba, and that approach was transplanted fairly seamlessly to the US as Cubans came to places like New York, Miami, and the San Francisco Bay Area. The rumberos would coalesce around a few notable Cuban elders and create a new community for a style rich in possibility, but with a legacy that goes back decades. 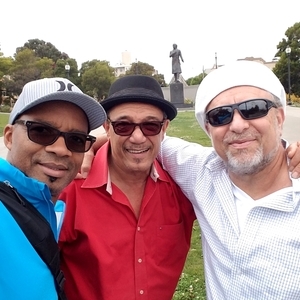 These American rumba moments, entwining Afro-Cuban religious ceremonies with secular celebrations, brought together Michael Spiro and Jose Luis Gomez in San Francisco in the early 1980s. Michael was a young professional musician working his way into the Bay Area Latin music scene, and Jose Luis was a newly arrived Cuban emigre and former basketball coach obsessed with the rumba of his native country. They played together for years, and later came to “share” a Cuban elder who instructed and inspired them, Regino Jimenez Saez. 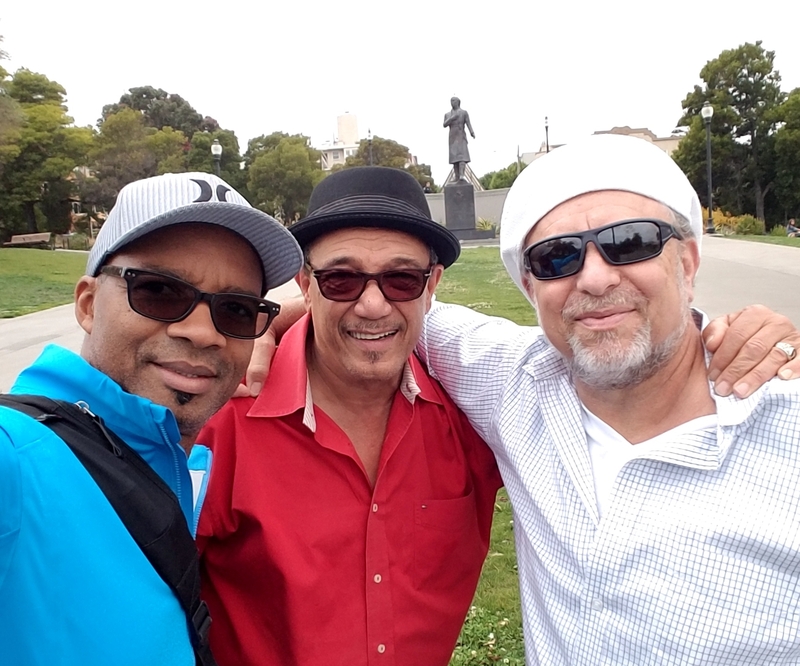 Regino was one of the few Cubans who was able to obtain a visa to come to the US to perform and teach, and he soon became one of Michael and Jose Luis’ mentors. When he passed in 2004, Michael and Jose Luis vowed they would record an album to honor him. Then life happened and a decade passed. But the two friends, along with producer/percussionist/vocalist Jesus Diaz (who’s played with everyone from Carlos Santana to Sheila E) finally came together as Los Rumberos de Bahia to pay tribute to “los mayores,” the elders who sustained and guided them. With the release of Mabagwe (“Remembrance” in Yoruba; release: March 23, 2018), the provide us with a wide-ranging exposition of the power of rumba and the gifts of the elders to our musical community. "I've been friends with Michael Spiro and Jesus Diaz since I came to the US 35 years ago, and we continue to share the stage professionally and participate together in rumbas and Afro-Cuban religious ceremonies,” Gomez explains. “The level of respect we have for each other, and the professionalism we have in our work always exceeds my expectations. Any time these two guys want to jump into some project, I'll be there." The rumba runs far deeper than the party music and social dancing most people outside of Cuba associate with the style. Its breadth can embrace all the diverse spiritual traditions and rhythms of Afro-diasporic Cuba. It’s where Cuban music began, where Spanish decimas intersect with Yoruba-inspired call and response choruses to yield something radically new yet grounded in everyday life. The balm for emotional and spiritual loss is remembrance and celebration, and Gomez, Spiro, and Diaz have gathered some of the strongest rumberos in the US and Cuba. 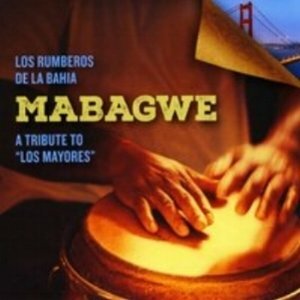 The songs they selected for the elders range from classics (“Oye mi omelé” made famous by Los Munequitos de Matanzas) to new rumbas composed for Saez (“Elegía a Regino”). They encompass the many rhythms that often make their ways into rumbas, giving voice in pieces like “Lo que me dijo Changó” to the different orisha (spirits) who make themselves known throughout Afro-Cuban music and culture. The result does more than honor the elders; it gives an earthy, beautifully recorded window into a Cuban style worth getting to know in depth. It is performed here by musicians who have spent a lifetime exploring its subtleties and power. Then life happened and a decade passed. But the two friends, along with producer/percussionist/vocalist Jesus Diaz (who’s played with everyone from Carlos Santana to Sheila E) finally came together to pay tribute to “los mayores,” the elders who sustained and guided them. With the release of Mabagwe (“Remembrance” in Yoruba; release: March 23, 2018), the provide us with a wide-ranging exposition of the power of rumba and the gifts of the elders to our musical community.